The Cassini Saturn orbiter first spotted lakes in Titan's northern polar region using its radar instrument very early in the mission. The lakes were initially invisible to Cassini's optical instruments, because when Cassini arrived it was winter at the north pole, so no sunlight ever reached them. Over its long, long mission Cassini has seen Saturn and Titan go through equinox, and now they are approaching northern summer solstice. That keeps the lake district in the sunlight for most of the Titan day, and also gives sunlight a shorter path through Titan's smoggy atmosphere to the north pole, making images clearer. Recently, image processing enthusiast Ian Regan has been working with Cassini photos, developing his own recipe for processing the fuzzy raw frames into crisp, colorful views. A portrait of Titan using images taken through several infrared filters processed into "pseudocolor" reveals its northern lakes region receiving summer sun. To the south of the lakes, near the bottom of the disk, is the Belet sand dune region. A near-global view of Titan shows its surface from the north polar lakes to the equatorial dune fields of Fensal-Aztlan and Senkyo. 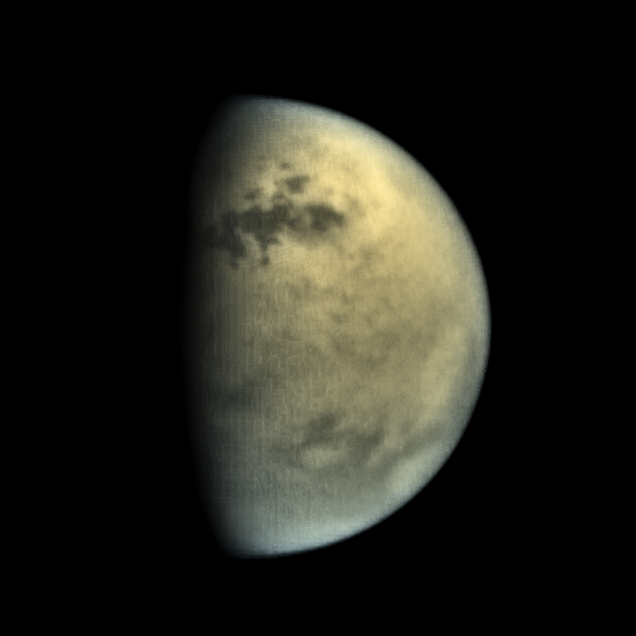 The center image shows Titan approximately as it would appear to the human eye, its surface hidden by haze and its north pole experiencing a summer "hood". 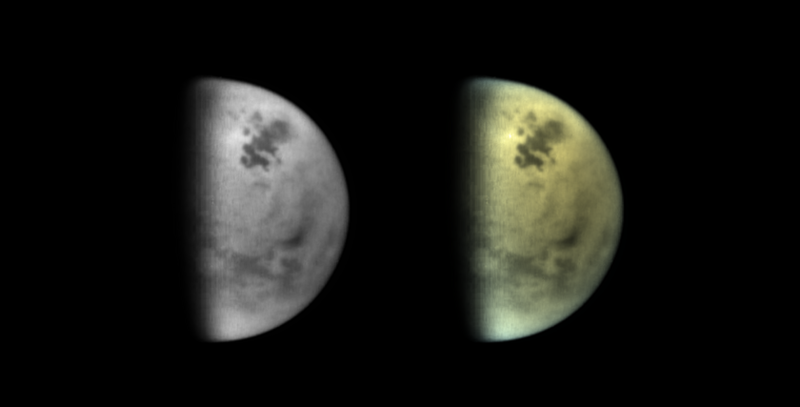 On the right, surface details are revealed by looking at Titan in an infrared wavelength ("CB3") at which methane is relatively transparent, and correcting for the affect of the methane in the atmosphere by dividing that image by one taken in a wavelength where methane absorbs light. On the left, the enhanced surface image has been colorized using data from methane filters in a way that mimics the natural color of Titan. Ian kindly shared his recipe with me. He begins with raw Cassini images of Titan taken through infrared filters CB3, MT1, and MT3, common choices for Cassini Titan imaging. These filters block all but very narrow slices of the electromagnetic spectrum from reaching Cassini's camera detector. 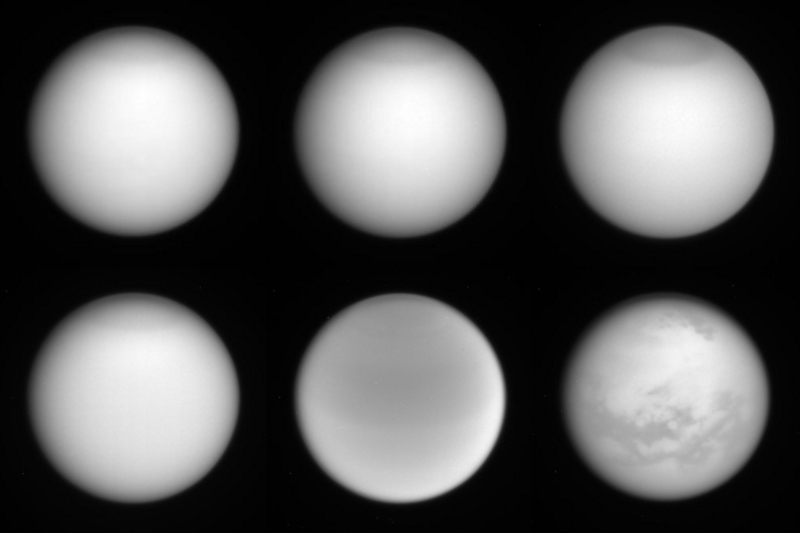 By rotating different filters in front of the camera, Cassini's scientists can study how Titan reflects sunlight at different wavelengths, see structures in the atmosphere and on the surface, and sometimes even detect compositional differences from place to place. MT1 and MT3 are in wavelengths where methane in Titan's atmosphere absorbs light (at about 620 and 850 nanometers). CB3 is at 950 nanometers, a wavelength in which methane is relatively transparent, so surface features become visible. Cassini usually takes several CB3 images in a single observation, which can be stacked to improve the signal. Ian uses the free and open-source ImageJ for image manipulation, aided by the StackReg and Bio-Formats plugins. Following is the recipe he uses; it sounds like these tools could be useful for other image processing projects. Clean the three CB3 filtered frames, removing comic ray streaks and hot pixels. This process is made more difficult when working with raw images, where there are strong JPEG artifacts around the hot pixels. Repeat this process for the MT1 and MT3 filtered frames, if multiple exposures are available. Align the three CB3 frames in ImageJ using StackReg (usually Translation mode will suffice and no rotation, scaling, or shear is required). Use Z-project within ImageJ to average the stack. Import the MT1 frame. You may need to translate this slightly to line up properly with averaged CB3 frame. Use ImageCalculator within ImageJ to divide the CB3 image by the MT1 image. Manually adjust brightness / contrast settings. Convert to 16-bit if finer control of brightness is needed. In image editor of one's choosing (in my case, PSP X6), create color composite using CB3 (R), MT1 (G), and MT3 (B). First be sure to reduce white point of MT3 frame to 150pts. Optional extra: add inverted MT1 frame on layer, set to 'Dodge' to brighten limb and/or terminator areas. Optional extra: high-pass sharpen the final merged product, or employ Tone Mapping. I thank Ian for sharing his notes. Want to see more of his work? Check out Ian's page in The Planetary Society's amateur image library, and see much more on Ian Regan's Flickr page.